In my post about the Skechers store opening in Wijnegem I gave away that I didn’t leave the shop empty handed. It took me a while, but I finally found a moment to shoot my favorite outfit with my new Skechers Go Step sneakers! My sneakers are a lovely beige-white print on a lightweight mesh fabric, making them perfect for the warmer times ahead. I can wear them under dresses and skirts and add a cool-factor to my looks, without having sweaty feet haha. The sneakers have some technical advantages. The memory foam in the insole gives a custom-feel fit and the sensors in the outsole offer flexibility and feedback for a comfortable walking experience. Most important to me however, was the arch support. As some of you know I’ve been experiencing troubles with the comfort of most fashion shoes and after suffering from a few hip injuries I recently converted to sneakers and other firm footwear. After two intense weeks on my new job I finally was able to relax this weekend. On Saturday we picked up fresh garden plants for our terrace, potted them in between the rain showers and went to see the new Kommilfoo show in the evening. My mom has been excited about their shows for years now, so I was curious to finally see them live myself. Their social criticism combined with often confronting reflections on life really awakens the social worker in me. Food for thought… well, a five course meal for thought on a Saturday evening! Sunday was all about food too, with a visit to the annual food truck festival for a much anticipated dose of pulled pork and hipster nice cream. I tried avocado ice with cocos and lime, while K opted for pear with lemon and something I forgot. I secretly liked his better than mine, but my inner hipster was still satisfied because…avocado. Back home we kicked back and enjoyed the unexpected sunshine with a cooled Strongbow apple cider and some weird Mexican playlist we found on Spotify. The good life, people, the good life. Ooh I love them! I didn’t know that sketchers have started doing more stylish shoes now (I always remember them being those huge chunky trainers from the early 2000’s haha)! They look so comfy! And I love the print on those trousers! aaaaah zalige look! ik weet dat het hier over de sneakers gaat, maar dikke liefde voor uw broek! 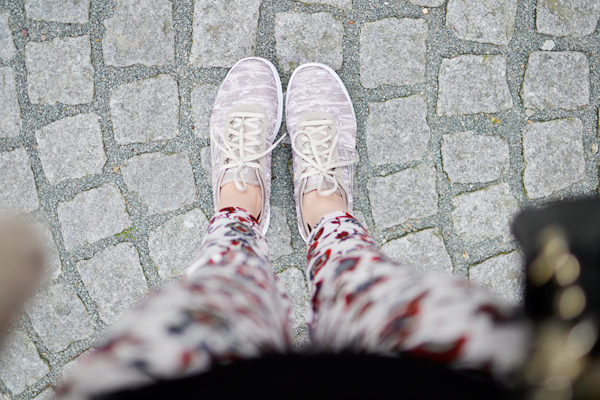 Such a cute pair of patterned sneakers! I’m loving them with those fantastic floral trousers. This whole outfit looks super comfy and cute! Love your printed pants! 🙂 Your shoes look cute and practical too – glad they have such great support! Thanks Mica! The pants caught my eye and I sort of bought them on a whim, but I have been wearing them loads lately. I’m still learning my trade, but it’s going better each day. I’m optimistic! Die sneakers zien er inderdaad mega comfy uit! Ohh die broek vind ik echt mooi! !